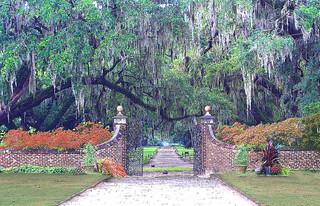 This is the famous entrance to Boone Hall Plantation. Often considered the most beautiful entrance to any home in America. Boone Hall Plantation, although a tourist attraction, remains the home of a private family. This is also the lane that Orry (Patrick Swayze) road up at the end of the Civil War in the mini-series North and South.